Salam and hello dear readers. 2015 is moving really fast. I can't believe it is going to be the end of the second month of the year already. Here are some shots of me at a place where I spend most of my time at currently! Green is a colour I rarely wear but I've been loving this comfy green aladdin pants which I first wore in India (see 2014 Reflection : Travels). Since it is a strong deep green colour I toned my outfit down by wearing neutral colours for all my other pieces today. I realize I've been wearing my ZERENE as a top a lot more than as a jacket. However, I feel that the ZERENE pieces spice up any kind of simple outfit I wear on a daily basis. Tomorrow is Chinese New Year so I would like to wish Happy Chinese New year to all my Chinese friends and readers and happy holidays to everyone else. i love this colour combination!! the black and white shots kinda ruined the 'feel' though. 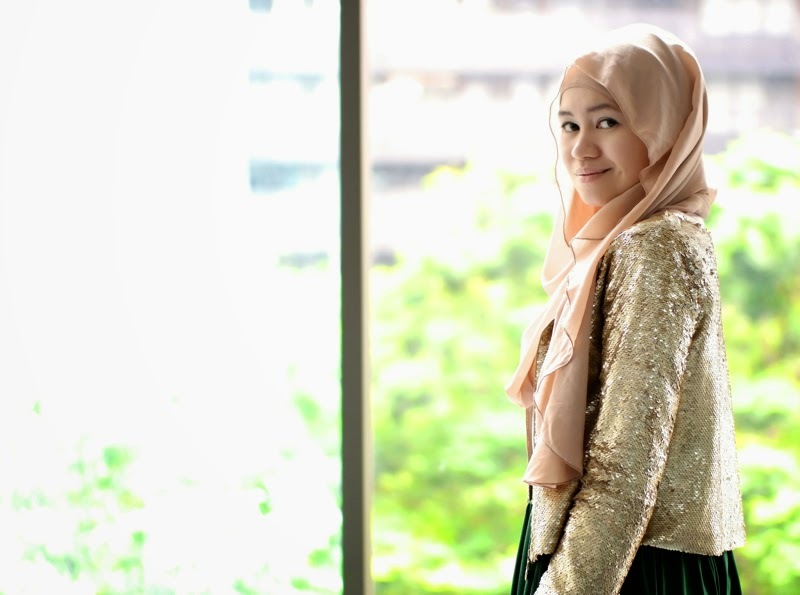 macam misplaced sikit..
Assalam Nadia, I will definitely one of these sequins jackets soon. I hope it's not over the top as I will wear it as daily wear. I love the zip part in front, means I can breastfeed my baby too. I'd love if aere to produce range of stylish pants (the pants you are wearing...owhh...), not too tight & below the ankle. Anyway, this style shouts simple yet I'm a diva (in whisper). Assalam Nadia, I will definitely own one of these sequins jackets soon, the silver one maybe. I hope it's not over the top as I will wear it as daily wear.